You’re about to take that leap into the world of homebuying, but you’ve discovered the housing inventory in your area is currently low. That means the market is competitive. Don’t let that intimidate you! You should still be able to find a great home for your family - you just need a few tips to navigate this competitive market as a first-time homebuyer. It’s important to stand out from the competition in a low housing inventory market and you can do just that by following these tips. Get pre-approved with our Keys on Time program and shop for a home with confidence knowing you have preliminary approved financing. You will know exactly how much of a loan you will qualify for which will help you in your home search. More importantly, it will also help you to beat out other bidders, as a seller knows you have already been pre-approved for financing and can guarantee you’ll close escrow on time. This will help make your offer to purchase stand out in a competitive market. Tip #2: Be ready to act quickly. You don’t want to jump into a deal that isn’t for you, but you also don’t want to take too long to make up your mind. Come up with a list of must-haves for your new home and if you find a home that fits most of your list, is in a neighborhood that you’re comfortable with, is at a price you can afford, and generally feels right - go ahead and make that offer. You’ll also need to be ready to go out and look at homes on short notice. If your realtor says a home just came on the market and might be a fit, you may want to drop what you’re doing and go take a look! Tip #3: Give a well priced offer. A competitive market is not the time to try and negotiate. In this type of market, you may want to offer the full asking price for the home or even above that price if you can afford to do it. Sellers will be looking for well-priced offers combined with other factors like being pre-qualified. Keep in mind that an appraisal will have to come in at the purchase price or higher, so it may not make sense to offer more than the home’s real value. The more flexible you are with dates, the more attractive you will be to buyers. If they need a shorter closing period, you may want to deal with the inconvenience in order to get your dream home. If they need a longer period in the home after escrow, you can offer to rent back to the buyers for a fixed time, which may be very attractive to those who are trying to buy another home after selling. 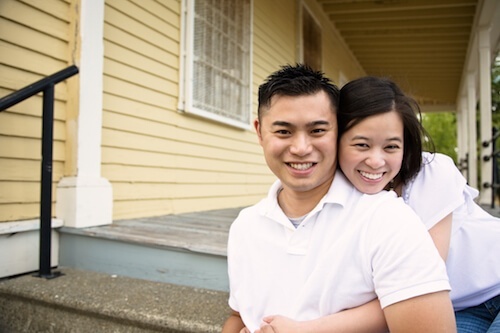 Tip #5: Take advantage of first-time homebuyer programs and specialty loan programs. By using these programs, you may qualify to have lower down payments and a lower interest rate, which means you can afford to get a home that’s priced a little higher. You can also find programs that help you qualify for a loan when you don’t quite fit the mainstream borrower mold. Mortgage Glossary: Helps you become knowledgeable about all mortgage and related terms. Mortgage Checklist: Guides you through the application process. Home Buyer Blog: Keeps you up-to-date with helpful and informative articles. Supply and demand can shift and a low housing inventory market won’t last forever. Experts are suggesting that a shift toward better inventory numbers may happen within the next year or two. But navigating the low inventory situation now may mean that you are rewarded with lower mortgage rates and possible tax advantages that could change significantly in a couple of years. With our tips and resources for first-time homebuyers, you’ll be ready to handle shopping for your dream home in a low housing inventory market. Think of your family as the dream home team, with an APM loan advisor coach to lead you to homebuying victory! Contact us today - we want to be part of your team!